On Sept. 21, 2017, Jodi and Eric Garbison of Cherith Brook Catholic Worker were involved in an incident with four police officers. The Garbisons were arrested and charged with hindering a police investigation and resisting arrest. 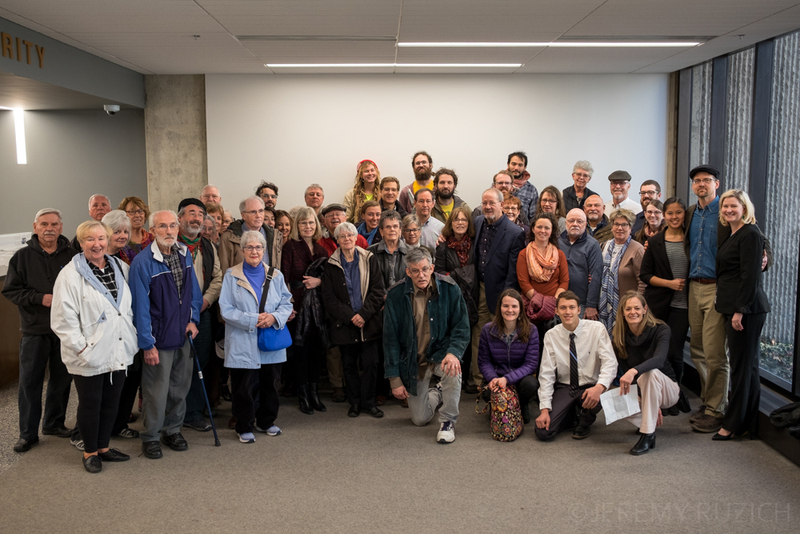 On March 2, more than 110 people gathered to support the Garbisons at the KC MO Municipal Court as they took their case to trial. Judge Ardie Bland presided, and Eric and Jodi were represented by Sara Hofeditz Christensen. Over the course of four hours, three officers present on the night of the incident testified, followed by Eric, son Henri, Jodi, and daughter Diana. In the courtroom, Officer Mahoney was the first policeman to testify, recounting that on the night of Sept. 21, the officers arrived at Cherith Brook to conduct a residence check for someone who is a frequent guest of Cherith Brook. Apparently, this guest had an open felony warrant, although the officers did not have the warrant with them. Mahoney told Eric they were looking for this person as a witness. After Eric explained that while this guest received his mail at Cherith Brook, he did not live at the residence and never had. The three police officers at the front door prepared to leave. During these initial interactions, all witnesses testified that Eric was compliant, “inquisitive and cooperative” in answering the officers’ questions. Then, as all witnesses testified, Henri Garbison arrived home in his truck, pulling into the parking lot at about 9 pm, in the dark, at the side of the house. This, according to both the police witnesses and the Garbisons, was when the situation escalated. Henri, the second witness for the defense, testified that he saw a figure in dark clothing (shortly after identified as the fourth policeman) cross the path of his truck, coming to the driver’s side window from the passenger side. The officer was pointing a gun and shining a flashlight in his face. Officer Trost’s reasoning for pulling out his gun was that “most parties suspected for a controlled substance,” which was true of the person they were looking for that night, “are armed.” However, as the Garbison’s attorney suggested multiple times, it would have been unreasonable to mistake Henri, an 18-year-old, for a suspect in his 50s. All witnesses agreed it was at this point that Jodi Garbison, seeing a gun pulled on Henri and his arms twisted out his truck window and pinned to the top of his vehicle, came out past the porch. Mahoney reported that Jodi and Eric became “very agitated and concerned for their son” and “uncooperative.” Officer Caldwell, the second police officer to take the stand, had graduated from the Academy the previous month and was still in his training period. Caldwell testified that the officers gave Jodi and Eric at least 30 verbal warnings to stay put and not to hinder the investigation unfolding at Henri’s truck. The officers called this incident at the truck a “traffic stop” in the police report. Jodi, Eric, and Diana denied ever being given specific instruction to stay on the porch or on how they could avoid impeding the investigation. Meanwhile, Mahoney claimed that the reason for Henri being detained was that he tried to hit the officer with his truck when he was pulling into the driveway. Mahoney claimed that when Jodi followed him across the landing to figure out what was happening with her son, she was at an “arm’s distance” and that this was a safety concern to his team. It was made obvious by all witnesses that Jodi never reached out to touch him or cross in front of him. At this point, Mahoney grabbed one of her arms and twisted it behind her back, placing her under arrest. 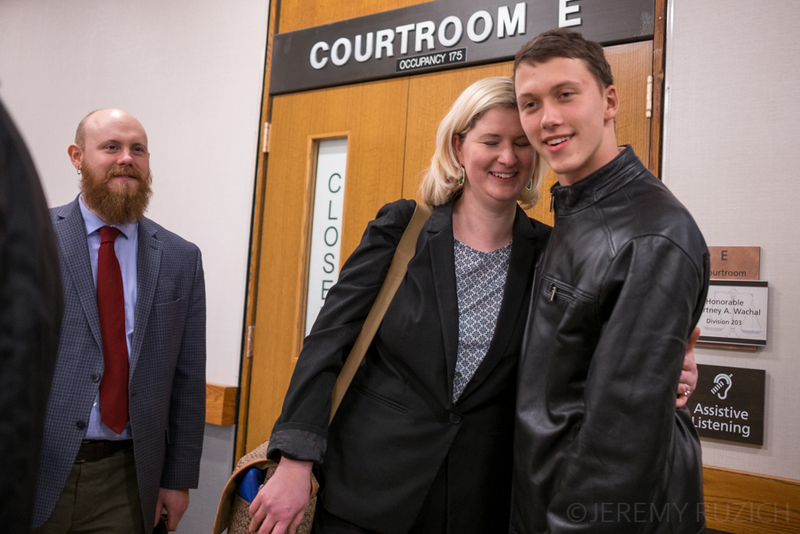 Both Jodi and Eric, who was immediately arrested by Officer Caldwell, testified that the police did not give a reason for the arrest despite being asked multiple times. Jodi and Diana told Judge Bland that Mahoney picked Jodi up off the ground and threw her face down into the asparagus, where an imprint was still visible March 2, before being cuffed. The officers’ claim, however, contradicted this, saying they took her to a grassy area and sat her down, even though no such grassy area exists in the front yard. Jodi and Eric stated that they never told the officers not to talk to their son, nor did they express intent to go down from the landing to intervene, both of which claims the officers made on the stand. The only clear and consistent testimony the police gave of Jodi and Eric’s state of mind was that they were concerned, “loud and anxious,” seeing their son detained by a fourth officer, coming from the backyard at the fence line. In the defense, Attorney Christensen focused on the Garbisons’ compliance, the incompetence of the officers in not understanding who they were looking for, and their use of excessive force, given that the suspect was charged with a nonviolent offense. 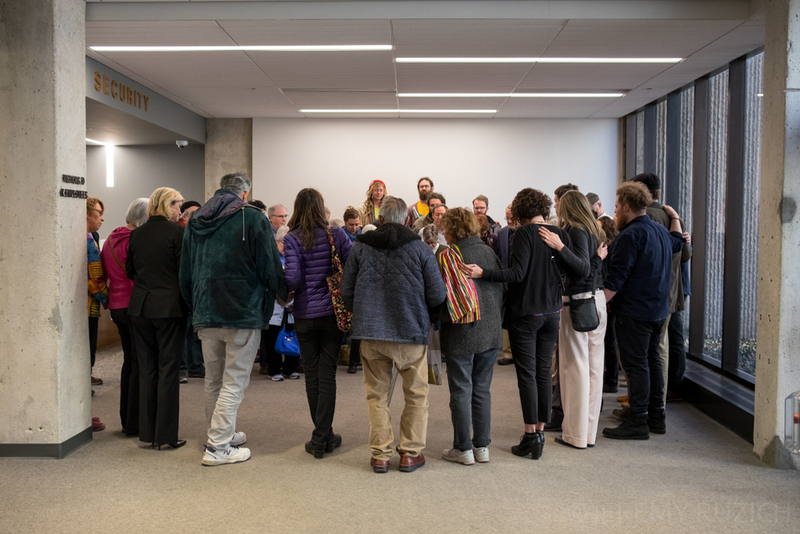 The prosecution attempted to raise doubts about the Garbisons’ intent in the encounter, drawing on past arrests for civil disobedience, which were quickly defended by Sara and Eric, who made it clear that the situation was not an organized direct action. Overall, testimonies made clear that the Garbisons were compliant and became agitated and nervous only when a gun had been drawn on Henri and they were prevented from seeing whether or not he was safe. After hearing the case and taking a short recess, Bland gave his decision. He opened by saying he believed the police officers, emphasizing a statement he kept hearing throughout the trial—that the police succeeded in doing everything in their power to prevent Jodi and Eric from going down the steps from the landing and hindering the investigation. Because he believed this statement, Bland stated the police made it impossible for the Garbisons to hinder the investigation, which is what their first charge was. As such, Bland said the second charge of resisting arrest was ungrounded because the police did not have reason to arrest the Garbisons in the first place. 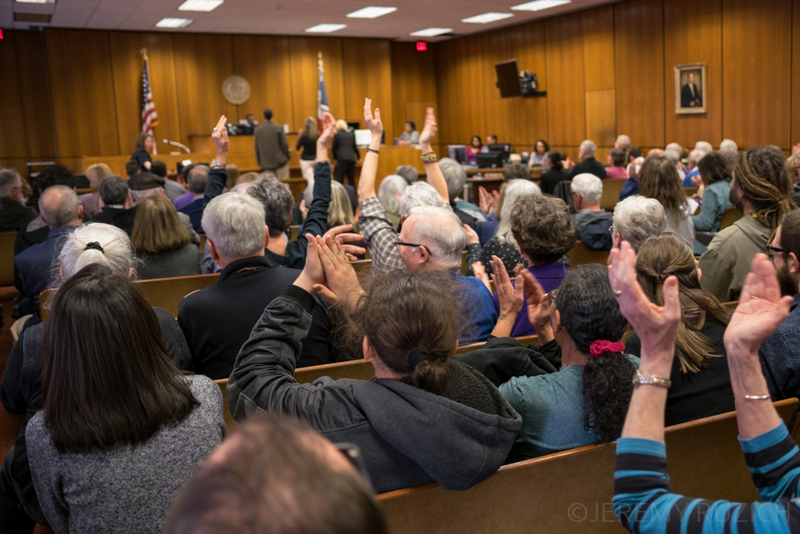 Ultimately, Bland found Jodi and Eric each not guilty on the two counts for which they were charged, and the decision was met with resounding applause from the crowd of supporters in the courtroom. —Virginia Davis, who has participated in life at Cherith Brook since June 2017, works at Migrant Farmworkers Assistance Fund, interns at the Heartland Center for Jobs and Freedom, and will enter law school at UMKC this fall.